Leaky pipe joints: the joints on your pipes are vulnerable and may become weak and spring a leak, we will then have to access the pipes to replace this and to avoid any further damage. High pressure: your pipes and valves are designed to sustain a certain amount of pressure – if this is exceeded it can cause your pipes to crack. Rust: this is more common in older galvanised steel pipes rather than newer copper instalments. Change in temperature: drastic changes in temperature can cause pipes to crack and burst. This is especially an issue in cold weather when pipes can freeze and crack. If a leak should occur it can cause significant disruption in your home, causing damage and inconvenience. In most modern systems if the pressure drops below a certain level because of a water leak your boiler can shut down leaving you without hot water or central heating. 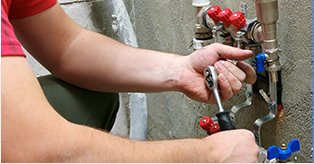 Here at Cheshire Plumbers our leak detection experts can find the leak quickly and disruption is minimalised by quickly finding the source of the problem. If you would like to find out more about our leak detection services then please get in touch with a member of our expert team.